View looking south towards the entrance to the Trinity College Science Park, about 500 meters away, at the end of the morning rush hour. Traffic in the right lane is for the science park, and it often backed up to the A14. 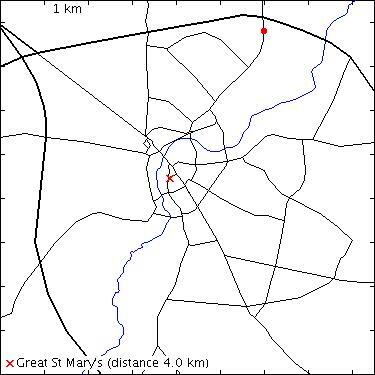 In 2006 the entire road system here was re-designed. The right-turn into the entrance of the Science Park was given two lanes. And the roundabout at the A14 in the outgoing direction was given an extra lane feeding directly onto the westbound entrance ramp of the A14, giving people heading that way an easier go of it. The left lane in the photo was added in 2000, it was meant for traffic turning into Cowley Road, mainly for the Cambridge Business Park or St John's Innovation Centre. 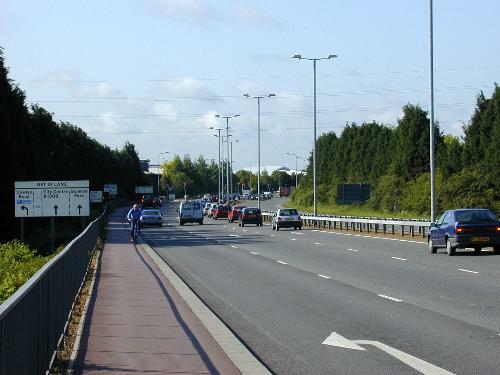 In 2006 it was converted for use of traffic heading into Cambridge when the lane for that was converted for use by the Science Park, and a shorter exit lane was added at the left. It was the other direction, during the evening rush hour, that was the problem for people who worked on the left side of the road, since traffic backed up, often badly, in Cowley Road. There was another exit, located at the Cambridge Business Park end of Cowley Road, heading into the city, but this was blocked for all vehicles except buses. In 2007 this part was re-designed to have two entrance and exit junctions, accessible by all vehicles.